When embarking on any building project, the first task for contractors is always to ensure they know what is below the ground, before they start excavating the site. Up till quite recently, there was very little technology to warn construction workers of voids or embedded structures which might be under the site, and which could cause risk to the workers as well as consequences to the public. However, with modern technology, the construction industry can now use concrete imaging to provide essential information about the site, and about the materials being used, before the start of the project. There are several types of concrete imaging which can be used, the best known being x-ray or radiography, and ground penetrating radar. 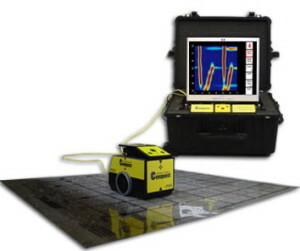 The x-ray technique uses gamma rays, which carry some radiation risks, while GPR uses sound waves. Another possibility is Ferroscan, which is mainly used to locate steel or iron which could be embedded in the concrete. Because the x-ray technique carries so many risks, and usually requires the evacuation of the entire area when it is being used, GPR is the most commonly used technique, and x-ray scanning is becoming redundant. Apart from the safety issue, it is much faster, with a scan taking 15 minutes as against 60 minutes for an x-ray scan. With GPR, thousands of square metres can be scanned in a short time, and a single scan will provide multiple 3-D views. Radar is obviously far more cost-effective, and often produces more reliable results. Ground penetrating radar technology uses high-frequency radio waves, which are transmitted into the ground or concrete structure. 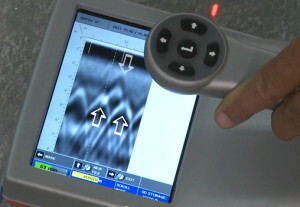 The presence of any obstruction is signalled by an echo, and the location of the obstruction is identified both by the strength of the signal, and by the time it takes to come back. Radar can be used in a wide range of media, including cement, soil, rock and paving, and even ice and water. One of the most common, and most important, uses for imaging equipment is for detecting the presence under concrete of post tension cables and rebar. Post tension cables are used in concrete construction, and usually consist of high-strength steel strands enclosed in plastic sheaths, which are arranged in a grid structure to support the concrete, and “tensioned” or tightened after the concrete has hardened. It is important for contractors to avoid hitting these when drilling or cutting, because the high degree of tension poses danger to them, as well as threatening the integrity of the structure. Alternatively the concrete might have been reinforced with embedding steel rebar, or reinforcement bars, which also need to be avoided. Another extremely important use for GPR scanning is for locating underground power lines or utility cables, which if drilled into by mistake could cause damage not only costing thousands of dollars to repair, but resulting in major disruption of services to the public. Radar is also needed for investigating the actual structure of soil on the site, to ensure its structural integrity, and avoid problems in construction that could be caused by its being too loose, too sandy or containing too much clay. In addition it can detect the volume of bedrock present, or the amount of material that needs to be removed before reaching the bedrock. Concrete imaging is equally valuable in above-ground new building, and in renovation of existing structures. In any construction work involving concrete structures, including bridges and tunnels, it is dangerous to carry out drilling or cutting of walls or floors without inspecting below the surface. Similarly, in renovating such facilities as schools, factories or shopping malls, concrete scanning needs to be carried out to check for the presence of a utility which may have been overlooked. GPR can also detect empty spaces or voids formed under floors of industrial buildings. Before undertaking any imaging, there are some precautions that need to be taken. It is essential to ensure that all rubble and waste material is removed from the site first, as it could obstruct the radar and distort the accuracy of the result. In addition, if the soil is being scanned, it must be dried out, as any remaining liquid will cause the signals to be reflected back. GPR scanning is a vital part of any construction project, from commercial and industrial developments and redevelopments, to a residential house or estate. Not only does it ensure the safety of your workers, but it immensely reduces downtime, and greatly increases the cost-effectiveness of the enterprise. Concrete scanning and imaging are some of the major factors contributing to the overall success of your building project.